Bill Frisell side project from last year, where he formed a "band" with drummer Matt Chamberlain, and then the other two "members" of the "band" are producers. I guess it's sort of jazz, but not really. It's not really avant-garde either at all. It's just instrumental music that is sort of a blend of a ton of styles and is just awesome. Also features a lot of Viktor Krauss and Eyvind Kang, so string-wise it's pretty set. Awesomely executed stuff. 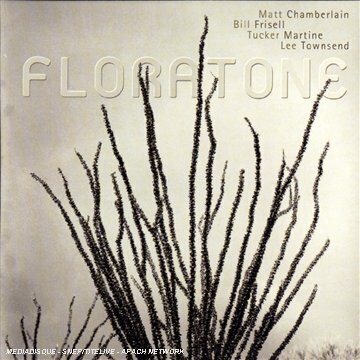 A casual listen might suggest that Floratone is a new Bill Frisell project (and that would be mostly correct), except every indication is that this is a fully collaborative project between Frisell, drummer Matt Chamberlain, and Tucker Martine and Lee Townsend. Composition credits are all shared and they all appear on the front cover. Why is that notable? Because while Frisell and Chamberlain are both credited with "loops" along with their respective instruments, Martine and Townsend receive only "production" credits -- no instruments. That's because on Floratone, the pure elements of sound and space are given as much attention as the music itself. Not only are there cool shimmering loops coloring the tunes, but any musical element can get treated, delayed, bounced around, echoed and twisted through 360-degrees of the stereo spectrum. With titles that invoke the South, the songs mostly float along at a languid pace anchored by the bass of Viktor Krauss. Ron Miles (trumpet) and Eyvind Kang (viola) also contribute to several cuts but don't really figure prominently. The focus is squarely on FrisellChamberlain and the soundworld they've created with Martine and Townsend. There's the slight reggae lilt of the title cut with some great dub-style echo and the New Orleans flavored "Mississippi Rising" with its second line rhythm. "Louisiana Lowboat" is somewhat lumbering and clanky, coming across almost like a Tom Waits instrumental. "Monsoon" rocks things up a bit and "Threadbare" gets a bit noisy, but this is mostly a pretty laid-back affair. It's great to hear Frisell messing with the delays again in a big way (see also the "West" disc of East/West) and the pure sonics of Floratone are as much of a treat as the playing. It's pleasant enough for background music, but careful listening will be rewarded. Try this one with headphones.